Buddhism arrived in the Philippines during the existence of Srivijaya empire from the 7th to the 13th centuries. This was followed by the arrival of Chinese immigrants and traders from the 14th to the 20th centuries who brought also with them Buddhism. The country has one of the world’s 20 largest Buddhist populations, with two percent of national population. Buddhism in the Philippines gained foothold with the rise of the Buddhist Srivijaya empire in Malaysia in the 7th century and lasted until their decline in the 13th century. 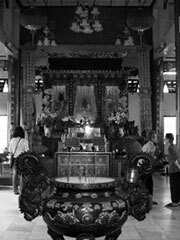 Centered in Palembang, Sumatra, active trading by Chinese and Indian merchants with native tribes brought Buddhist knowledge and iconography to the country. Archeaological finds in the Philippines unearthed priceless Buddhist statues and other artifacts dating to this era. Linguistic influence also left its indelible mark, with Buddhist concepts such as dukkha (suffering) and bodhi (knowledge) entering everyday speech.The Buddhist community in the Philippines today makes up about two percent of the population. All the major schools are represented, but they are predominantly of the Mahayana sect, as it is practised mainly by the Chinese and Filipino-Chinese community, and by Vietnamese refugees that settled in the country. Buddhism, however, is growing in other sectors, with the arrival of other schools from Japan (see Nichiren, Soka Gakkai), Thailand and Sri Lanka (see Theravada) and Tibet (see Vajrayana).